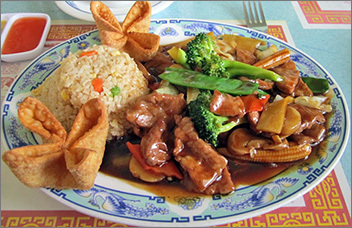 Mardarin Garden has been serving classic Mandarin/Chinese dishes in the Ashwaubenon neighborhood since 1984. Went here for lunch this afternoon and it was an average experience. Its an older place with old decor that hasn't been updated in decade(s). Its a unique building, its a big circle. Service and staff were prompt and friendly. Food was just okay and the portions were filling but not the surplus at other chinese places I've had. Prices are about $6-$8/plate at lunch. It wasn't a bad place or meal, but I wouldn't rush back either. I've been eating here for more than 20 years and have always had very flavorful, delicious meals. Everything on the menu is supreme! Excellent, warm service! THE best Chinese food in Green Bay! For lunch I chose to eat at the Mandarin Garden, a Chinese restaurant located in Ashwaubenon on the west side of Green Bay. It is in close proximity to the Bay Park Square mall. It is an octagon shaped building and as you walk in there is a full bar with counter and a hostess stand with register placed to the left right before the dining room. The interior is painted in a light mint green with a variety of different Chinese ornamental pieces hanging on the walls throughout the restaurant. The restaurant was clean but has noticeable wear and tear to it. The tables were all preset with vinyl tablecloths with clear glass coverings on top, pre-rolled silverware in paper napkins and paper placemats with the Chinese zodiac. Also placed on the tables were fried wonton strips to munch on while you wait, condiments of soy sauce and tiny serving dishes filled with hot mustard and sweet and sour sauce. The atmosphere is very informal and busy. The hostess put a menu on a table for me to sit at but then ignored me and left me standing there as she started talking to a group of male diners that were leaving and ready to pay their bill. I had to interrupt her to make sure that was the table she wanted me to sit at. I then went on to seat myself. My server came to take my beverage order and brought me a glass of ice water. I ordered their jasmine hot tea which is the only one they carry and is included with all their lunch specials. I ordered the Pork with Vegetables for $7.25 which includes a cup of either won ton or egg drop soup, I chose the egg drop, two appetizers which that day were crab Rangoons with fried rice on the side, and an extra side of two egg rolls for $3.5o. 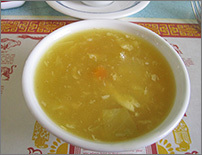 First my egg drop soup was brought out; it was a pale yellow color with a thick consistency and miniscule pieces of celery, chicken, carrots, and onion. The soup had a light smooth flavor but was not your standard egg drop soup recipe. 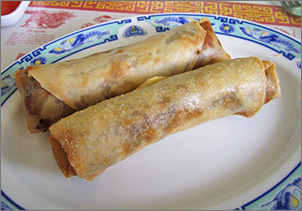 Next came my side of egg rolls. They were served hot and were not greasy but the rolls did not have a savory flavor to them, they tasted like they just used some leftover beef stir fry with a small amount of leftover vegetables mixed in. My pork vegetable entree was served next, it was attractively served on a small platter with a mound of fried rice and two crab Rangoons placed on either side. The stir fry consisted of sliced pork, pea pods, broccoli, and mixed vegetables in a dark brown sauce. The pork was tender and there was a nice amount of vegetables mixed in. It had a pleasing flavor when combined with the fried rice. The Rangoons were small in size, they were crunchy and warm with a tad of melting cream cheese in the center, delightful to eat. At the end of my meal came the bill with the customary fortune cookie. Mandarin Garden has a good selection of lunch choices to choose from with low prices and quick service.